Advertising is a necessary component of any successful business. In today’s market, businesses must work twice as hard to catch the eye of potential customers and rely on a variety of advertising methods to do just that, including newspapers, the Internet, radio, television, billboards and direct mail. Regardless what method you use to promote your business, you have a responsibility to abide by state and federal truth-in-advertising laws. The potential liabilities of engaging in false, deceptive or misleading advertisements can be crippling. If you are found to be in violation of state advertising rules or laws, you could be responsible for paying penalties and costs to the state and restitution to customers affected by your actions. 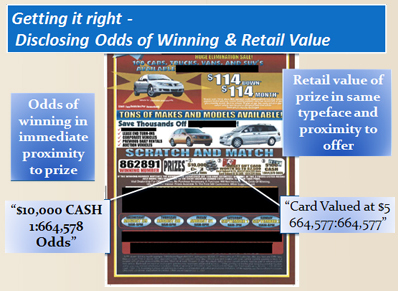 The maximum penalty is $2,000 per advertising violation with each printing counted as an advertising violation. For example a mailer with a circulation of 25,000 containing 4 advertising violations could be subject to a potential penalty of $2 million ((25,000 x 4) x $2,000). Most of the subjects of recent enforcement action have been responsible for the state’s costs at an average of $30,000 for attorneys’ fees alone. You can save yourself a lot of time and money by simply abiding by state and federal laws. To better assist you in complying with these laws, we’ve provided some general information regarding the do’s and don’ts of auto advertising. 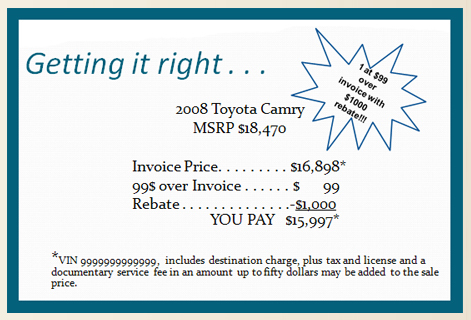 If an ad says a vehicle is being sold above, below or at invoice price, then the represented price must be the actual cost the dealer paid to acquire the vehicle from the manufacturer. Dealers can also include the actual cost of transporting the vehicle from the manufacturer and any mandatory advertising fees in the represented price. But they can’t include dealer holdbacks, flooring incentives, manufacturer-to-dealer incentives, optional advertising fees, dealer overhead, document fees or consumer rebates as part of the represented invoice price. 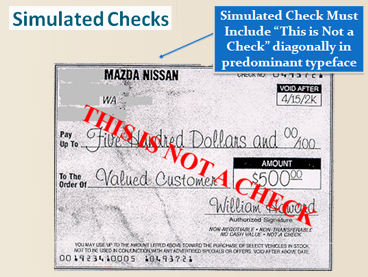 Any simulated check used as part of a promotion must state “This is Not a Check” diagonally in dominant typeface. In addition, don't imply an offer is “free” if any money must be spent to receive the item. Dealers may only offer authorized manufacturer rebates in conjunction with sale. Any offered rebate must be generally available to the public, available in combination with other rebates offered and expressed as a component part of the advertised price. 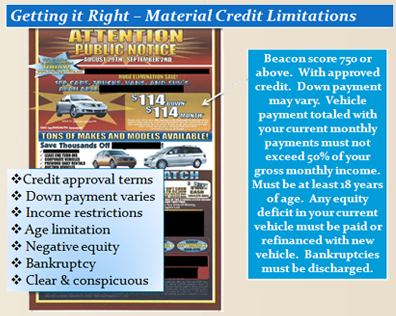 Dealers can’t advertise optional equipment rebates because these rebates are not generally available to the public. 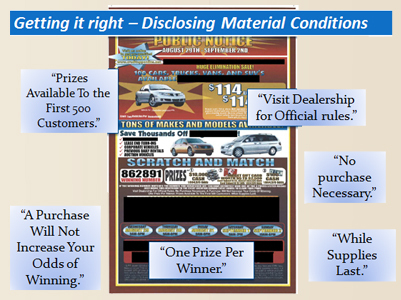 In addition, a dealer must disclose all material limitations in a clear and conspicuous manner and disclose specialty and loyalty rebates separately. A 2009 change to state law increased the documentary service fee from $50 to $150. In order to charge a documentary service fee, the dealer must include a disclosure about the fee in its advertising. Absent proper disclosure of the fee in print, radio and television advertisements, a dealer cannot charge a consumer a documentary service fee of any amount. A dealer may use in its advertisements the statutory language, “a documentary service fee in an amount up to one hundred and fifty dollars may be added to the sale price or the capitalized cost of a vehicle” or other language that conveys that the documentary is optional and/or negotiable. Language that infers that the documentary fee is mandatory or required does not satisfy the statute’s requirements. Include a written disclosure (in print that is same typeface as standard text and bolded, capitalized, underlined or set out to be conspicuous) stating that the fee is negotiable. This disclosure must be made before completing the purchase and sale agreement. Refrain from stating or implying that the fee is required by the government. Separately designate the service fee from the selling price and other fees, taxes and charges. Again, any advertisements must disclose that the fee may be charged as stated above. You may not charge the consumer any other fee (advertising, business & occupation tax) unless it is required by a state or federal statute. Don't use “cost,” “wholesale,” or “reference” pricing. Don't use auto or lending industry terms. Use only terms commonly known by the public. Disclosures in television advertisements (1) must be of a type size large enough to read with ease; (2) must appear on the screen for 7 seconds; (3) must be in a print type of type and color or shade that contrasts readily with the background; and (4) must not be obscured by words or images on the screen. Radio equally must be spoken with deliberateness, clarity and volume to be understood and must not be obscured by sounds that interfere or distract the listener. Disclaimer: This information is provided as guide and it is not a substitute for legal advice to ensure full compliance with the law.